The symptoms of bearing damage known as White Structure Flaking, which occur in wind turbines as well as other drive systems, typically become noticeable very early, well before the end of the bearing’s expected service life. The causes have long remained unknown, but now, new findings are being made available by bearing specialist NSK, the results of which have led to the development of a new bearing material that offers significant benefits for wind turbine longevity. Drive components for wind turbines have to meet tough requirements in terms of durability and resistance, and these requirements are becoming increasingly stringent. Onshore turbines traditionally require bearings that are designed to last for a service life of 175,000 hours, which is equivalent to 20 years. However, in the rapidly-expanding market for offshore wind farms, where high levels of investment and difficult location access are common, a lifespan of 25 years is required. With extreme dynamic loads acting on the drivetrain of a wind turbine, this requirement presents a real challenge. In onshore wind turbines, the main bearings undergo loads of approximately 1 MN. At sea, however, due to very high wind speeds, even stronger static and dynamic loads act on the rotor and, consequently, on the whole drivetrain. At the same time, the size and performance of the systems in both onshore and offshore applications grows continuously. NSK currently manufactures bearings for 9.5 MW turbines, which will soon be in full scale production. 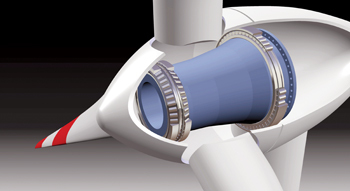 Moreover, the company is now developing bearings for offshore wind turbines with even higher nominal power output. Higher performance and the growing market share of offshore turbines are key drivers behind increasing demands for longer bearing lifespan. As a result, wind energy technology is an ideal application area for online condition monitoring systems, which continuously measure and analyse vibrations in the drive system. If bearing damage occurs, the faulty components (inner or outer ring, rollers or cage) can be detected early by analysing the measurement profile. A condition monitoring system (CMS) developed by NSK has recently been installed at an offshore wind farm in Japan. The role of the CMS is to detect anomalies sufficiently early to facilitate predictive maintenance strategies. NSK sees a large market potential for solutions of this type. However useful condition monitoring may be as a secondary measure in critical application areas, the primary engineering goal when developing bearings for wind turbines is still, and will remain, to ensure a high level of reliability. In this respect, manufacturers have already made considerable advances. For instance, an important contributor to progress has been the development of new materials and heat treatment processes, such as NSK´s proprietary Super Tough (STF) special steel. Bearings made from this material last twice as long as those manufactured using conventional steel. In fact, the related load rating increase was confirmed and certified in December 2017 by DNV GL. STF´s long-lasting characteristics have been achieved by using a particular chemical composition and a special heat treatment process. Typical symptoms of damage, such as fatigue life related cracks in the bearing raceways caused by non-metallic inclusions in the bearing steel, are virtually eliminated in bearings manufactured using STF. One issue that still afflicts the industry is the type of damage known as White Structure Flaking (WSF) or White Etching Cracks (WEC). 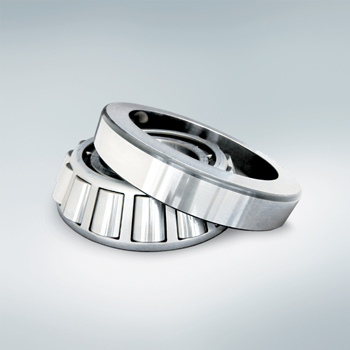 In the case of both failure modes, certain areas of the material under the bearing´s raceway show local embrittlement. The brittle structure cannot withstand the loading and are thus the nucleus of cracks. Eventually, these cracks grow up to the raceway and finally the bearing fails. It is typical for this type of damage to appear relatively early; sometime shortly after the system has been put into service. After conducting a picral etching, these entities show a white appearance and are thus called white structures. Intensive tests in NSK’s research and development department have been able to replicate the damage and give some hypothesis about its origin. Various rolling contact fatigue tests have demonstrated that white structures are caused by hydrogen penetration. This hydrogen penetration is most likely affected by several factors and their combination, including axial or circumferential slippage between rollers and raceways, electricity, and certain types of lubrication. Hydrogen subsequently penetrates the raceway and forms the typical white etching structures that lead to crack formations and eventually result in flaking. These cracks can be several millimetres long and spread from the interior out to the surface. Destructive tests of used bearings that showed no visible signs of surface damage demonstrated that white etching areas can even be present here. When the damage is examined in more detail, it can be observed that under the influence of hydrogen, the originally martensitic microstructure degrades into a very fine-grained, brittle ferrite. This mechanism can be explained by the Hydrogen Enhanced Localized Plasticity (HELP) theory. One of its characteristics is that plasticity only occurs locally and that the global fatigue of the bearing is slight, so it is not one of the classic types of fatigue damage which originate either below the raceway (due to the inclusion of non-metallic particles) or in the raceway (due to severe contamination). So, where does the hydrogen come from? 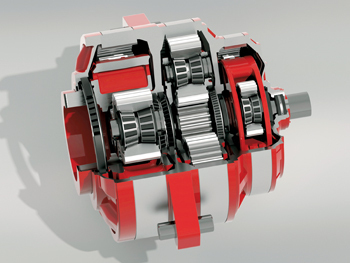 By comparing new and used bearing, NSK´s central research team determined that hydrogen only forms while the bearings are in operation. It is probable (at least this is the initial supposition) that the hydrogen comes from the hydrocarbon chains of lubricants and their additives. This theory was substantiated after the typical damage symptoms of the white structures could be reproduced in the laboratory with certain types of oils and greases. Similar damage was reported by the automotive industry in the 1990s, further supporting the theory. Here, the bearings of belt tensioners and alternators failed prematurely, yet changing the grease and the belt material solved the problem. However, the influence of electricity (current flow) on this failure mode has yet to be determined. NSK has developed new alloys that yield better results during rolling contact fatigue tests. In tests with hydrogen charging, the optimised chemical composition led to a five-fold increase in WSF resistance compared with conventional bearing steels. A significant improvement is also achieved by optimised heat treatment. Here, residual stress under the raceways can be increased by carbonitriding instead of through-hardening. Although this measure does not prevent the formation of the white structures, significantly fewer cracks develop from these structures, and they spread to the surface more slowly. Based on these findings, NSK introduced a new material for bearings called AWS-TF (AWS stands for Anti-White Structure), which combines the optimised chemical composition with optimised heat treatment. Tests have shown that while bearings made of AWS-TF do not totally eliminate the risk of WEC, the delay before damage appears is seven times longer compared with conventional bearing steels. Initial field tests in critical installation sites are currently ongoing and seem to confirm these test results.